One of the issues which has caused a fair amount of discussion amongst colleagues internally is the matter of images of Birmingham on the home page. There’s a strong view that as well as being a gateway to the services the website and the council as a whole offers, the home page should be used to market Birmingham the city, particularly by means of having pictures of Birmingham on the home page. We’re not automatically opposed to this idea on principle – but we are indeed unsure about it as a direction to go in, partly because we want to ensure the home page is as focussed and uncluttered as possible, and partly because we don’t think people come to the council website with a particular interest in looking at pictures of the city; residents will already know what the city looks like, and visitors and potential visitors will always find a richer source of imagery of the city from sites such as Flickr. There’s also the more pragmatic question of what images to use to promote the city? Selfridges has been a favourite iconic image since it opened here in 2003, but 10 years on it’s perhaps time to think of other iconic images. The Council House is another oft-used image by ourselves – but fine building as it is, is the organisational centre of the civic administration the best image to use to promote the city as a whole? We like to promote our canals in Birmingham, but actually there aren’t many canal vantage points which are both highly photogenic and at the same time clearly uniquely Birmingham rather than canals anywhere. We’re all getting quite excited about the opening of the new Library of Birmingham this coming September, so we’ve chosen to use a highly de-saturated image of the building’s cladding as a background image windowed across the home page’s six segmentation boxes. I’m not a big fan of putting images on the front page. I don’t think people will stumble across the site and decide to visit/invest in Birmingham based on images. There is a great advantage in ensuring that the entry page is devoted to function. This is a page that we will expect residents to visit many times if this is going to be their principle channel for engaging with the Council. I guess from a residents perspective you want to get to the information you need fast, so images not needed. Having said that I wonder if people outside fo Birmingham would prefer a “prettier” introduction page. I would try to understand the distribution of current users of the website and apply a bit of guess work as to what they want from the site. Alternatively pick up their location and adapt the front page accordingly (if it is possible to pick up html5 geolocation form the final solution?). Images with news items can cover both cases, makng the iste look less bland and drawing the eye to the news item. A responsive solution – interesting! There’s no reason why it shouldn’t be technically possible in the final solution, although I wonder if people might get irritated by the browser asking them if they agree to share their location when they arrive on the page? Have you considered using a large background image? If done correctly is doesn’t interfere with the UI for residents but can ‘sell’ your city. They’re both good examples, yes, and represent quite nice, ‘clean’ designs also. I think if we were to go in this direction, an image of Edgbaston Reservoir might be a good choice. The choice of six screengrabs is very interesting as they all look pretty much the same. I’d love to know your thoughts on a site such as Manchester’s. I am not one for always comparing Birmingham to Manchester, but their site “gets it”. No clutter, simple, obvious, and a lot more likely to achieve channel shift than anything else Birmingham is trying to do. Has any consideration been given to buying something “off the shelf”, or at least cloning what they do? It is even cleaner and simpler than the Government’s decentish efforts to reform the web! I just fear this is another reinventing the wheel exercise, that will leave BCC with egg on its face, as the 2009 “revamp” did. Cut the jargon and nonsense pages, use simple clear logos, order them in priority based on proven demand, and we will have a site to be proud of. It was another sad day for our town centres as it was announced, after going into administration a few days earlier, all 187 Jessops photography shops would shut at the end of the day, with the loss of 1,370 jobs. Back 15 years ago, when I used to be considerably more into stills photography than I am now, Jessops on New Street in Birmingham was my favourite shop; they had knowledgeable staff, catered well for both digital and chemical photography, but best of all, they had a massive front window stacked up with a wide choice of second hand cameras, lenses, and other equipment, at a good choice of price ranges. Then the New Street branch closed, to be replaced around the corner by the Jessops ‘World Camera Centre’, which curiously with a doubling of floorplate space had a fraction of the stock – and big second-hand front window being replaced by a small second-hand glass case. More recently over the last year or so, whenever I’ve gone into the Jessops World Camera Centre I’ve found the customer experience incredibly frustrating. The print-it-yourself machines not working, the lack of basic stock available, the immense difficulty of attracting the attention of a shop assistant, and when that attention is finally attracted, the shop assistant not having the faintest idea what I’m talking about (“what’s a flash bracket?”), or the most usual response “oh, we don’t have any in stock right now – we’ll have to order one in”. And it’s not just Jessops where I’ve had that experience – that’s become my default experience from most shops which sell products I merely want rather than such as food and clothes actually need. Tech shops, camera shops, book shops, record shops (well, such as there are any record shops left), DIY shops, jewellery-making supplies shops, whatever – you name it. When considering goods which people don’t need but want, the value of a shop over the internet is three-fold – the hope that the customer who needs advice can be advised by somebody more knowledgeable than themselves, the possibility that an impulse decision to want something can be satisfied immediately, rather than having to wait several days for it to be delivered, and the ability to handle the goods in advance of purchase – to check for oneself that the product on offer is indeed the product one wants. But if the person in the shop knows less than you do, if the person in the shop says ‘sorry, we’ll have to order it in for you’, or if – as in the case of many bookshops these days – the product is sealed and shrinkwrapped so you can’t actually verify its suitability in advance, then what is the point in going to the shop to pay a third more than you could have paid shopping online in the first place? It’s a curiosity that in the olden days when the owners of shops dictated what we could buy by their monopoly on the shopping experience, they still went to great lengths to ensure the shopping experience met our needs and encouraged us to buy from them, whilst nowadays the response of the High Street to the threat of the Internet is to just give up and blame the Internet for stealing its customers. Our High Streets are indeed dying. Rather than blaming The Internet, it’s time our shop owners responded to the challenge it presents by shifting to business models which improve on the Internet’s offer, rather than just moaning about the fact of the Internet being better at selling things than they are. As the project progresses we’ll be colouring those red boxes yellow and green, and adding more boxes along the trees, and of course adding new boxes and branches as new products are identified. In order to make this whole project manageable, we need to split it up into a number of (initially five) sub-projects, from which our agile / Scrum series of products will emerge. This is how people will navigate through the site – not just by the menu structure, but also A-Z, related links, and search. It will be looking at how content fits into the six top levels, identifying where the possible points for confusion lay, and mitigating that possible confusion. Relating to Information Architecture, we need to perform a content audit of the existing site and determine what pages we will need on the new site – the first pass being to establish what each page will cover, with subsequent passes being to actually write the new content based on matching and amending existing content to bring it in line with new content guidelines – which also need to be developed as part of this project stream. 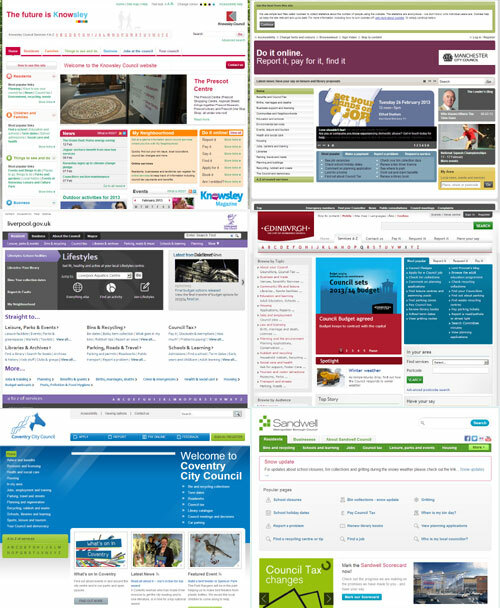 Whilst we like the design we’ve created in broad terms and think it stands well against other council websites, we know there is still work to do on it – we don’t want it to look good within its own sphere, we want it to look good on the web as a whole. We know there are tweaks here and there to do with spacing which need making – which is a coding issue – but we also know the the colour scheme needs serious attention by those more qualified to design colour than we are! And of course as well as minor tweaks, we’re aware that there may need to be more fundamental changes made in the light of feedback we receive. Whilst this project is overwhelmingly a content project rather than a technology project, there will of course be technology aspects we will need to address, including possible changes we might need to make to our content management system – Fatwire – in order to realise the work on our site proper, including changes to the HTML templates and the addition of possible new functionality such as widgetised sidebars and RSS feeds. As well as changing the content of our website, we also need to change how the content actually gets on our website! Currently we have a wider pool of approximately 300 web editors of differing skills and amount of content to manage, dispersed according to the council’s directorate structure. The governance project will look at how best to create and manage content in the future. The Alpha project, inspired by the same methodology the central Government Digital Service has used as it redevelops https://www.gov.uk/ and Shropshire council’s Project WIP (http://shropshire.gov.uk/projectwip/), was conceived in March / April 2012 as a separate website on which we can develop and trial innovative developments in how we deliver services on birmingham.gov.uk in the future. Permission to proceed with the project was granted in early May, with the purchase order for the web hosting necessary for the work being sent to Service Birmingham on 7 June, with Service Birmingham delivering the development environment hosting on 4 July. Much of the background and preparatory work has been carried out over the course of time since summer 2011, including at various GovCamps, and work-in-earnest started on 12 September 2012. Alpha has been conceived and designed from the ground up to facilitate an agile, iterative development process, allowing full consultation to take place and feedback to be received from key stakeholders – including members of the public – to show full transparency in our thinking, and provide an evidence base for work which will in due course become the main site. The minimum level of disruption caused to the main existing site whilst the development takes place. The proposed starting point of the alpha project shall be a new home page, building on good practice already pioneered by Liverpool.gov.uk but leading to a radical new approach in local government website architecture. Current thinking describes 80% of our customers being interested in only 20% of our content, leading to a pressure for as much as possible of the remaining 80% of content to be culled. This however is a flawed view of who are customers are and what is important to them, and also ignores the legal and moral requirements for much of the content which is deemed to be uninteresting to the majority of customers to still be available to them in order to preserve the essential democratic accountability of the council. Taking a quantitative analysis of access statistics rather than a qualitative one ignores the possibility that the reason some pages are accessed rarely might be because they are so poorly presented in the menu structure of the site and are so poorly optimised for search that the customers who are interested in that content simply fail to find them. Other pieces of content – such as, for example http://www.birmingham.gov.uk/transum – which might be rarely accessed by customers might indeed not be intended to be anything other than rarely accessed, but still need to be present as archive documents for the stakeholders to access at any time rather than having to make phone or email contact with the council to retrieve them. Lastly, some pieces of content might only be accessed once a year, but if the person who is trying to access that content is the chair of the Local Enterprise Partnership responsible for the allocation of millions of pounds worth of investment in the city, their inability to find that content reflects badly on the council. Regardless of the reasons some rarely-accessed content might be rarely accessed, with website access statistics of the period 1 June – 1 July 2012 being 3,134,725 page views of 2,317,162 unique pages by 460,608 unique visitors visiting the site 731,470 times, it is clear that even a removal of 50% of the site’s content, let alone 80% would lead to the removal of a significantly measurable amount of content which if not there would lead to the reverse channel shift of customers needing to make a phone call, send an email, or visit a customer service centre in order to get hold of. It is accepted that there is redundant, out-of-date, trivial, and vanity content which serves no obvious purpose – for example, it is doubtful that any driver habits will been changed as a result of a driver happening to visit one of the pages linked to from http://www.birmingham.gov.uk/road-safety/driving-safety ; on the other hand the single page http://www.birmingham.gov.uk/highways-works-programme which at first glance appears to be a set of dry policy documents upon further analysis becomes essential information which if intelligently re-purposed and placed more sensibly in the menu structure and turned into a series 12 well-designed web pages could become a genuinely useful resource for the citizens of Birmingham, improving the reputation of the site and council itself, and contribute to channel shift by reducing the need for residents to phone up to find out when their road is due to be resurfaced. Members and council officers seeking relevant information. What’s on and leisure – similarly to About the city, containing information which transcends the uniquely defined customer profiles. At the heart of the six chosen segmented sites lies the principle that the customer must not be made to feel like they have been segmented according to a customer profile, rather that whatever informational or transactional need has brought them to birmingham.gov.uk site they should be able to immediately see in which of the six segments their need will be fulfilled. The global navigation of the Local Government Navigation List will be dispensed with entirely, however a form of global navigation – successfully adopted by the bbc.co.uk website estate for a number of years – will be preserved in the shape of the links to the six segmented sites appearing in a horizontal bar at the top of each page, with traditional local navigation on the left hand side, curated service-related cross-sell links appearing where relevant at the bottom of each page (eg the page giving information about cycling in Birmingham under About the city containing a ‘see also’ link to the Cycling Strategy policy document in The Council, or information about premises licenses which have been applied for under Residents linking to information about how to apply for a premises license in Business), and targeted channel shift and marketing and communications links in a column on the right hand side. There are two major principles which need to underpin the design of a new site – (a) the need for absolute simplicity, whether the audience is a digital native or a nervous computer user, and (b) the need to deliver a modern, fresh look unencumbered by the complexity of the conflicting needs and demands of the various diverse stakeholders. By starting off with a simple, bold, and accessible home page, which should scale gracefully to fit any screen regardless of it being desktop, laptop, tablet, or phone, the customer can instantly see that their needs will apply to one of the six chosen segments, and follow through with their task without being confused by the presence of information which is irrelevant to their needs. Aesthetically, the design will need to be simple, bold, elegant, and uncluttered; a combination of the modern with the timeless principles of Swiss design – big headings, finger-friendly for touchscreen devices, and bold iconography. The timescale for the complete package of work, from first release of the starting point of the proposed alpha designs to the completion of the work with all the old content and designs having been replaced by the new content will be up to two years. Although the above depicts a sequence of events, in actuality much of the work will be done using an iterative approach with some tasks been carried out simultaneously with others; a detailed timeline will evolve during the course of the project. Fundamental to the project is a desire for the whole process to be carried out in the open, allowing internal stakeholders and external customers access to the work in progress in order to comment and shape the developing work. As well as the alpha site being a publicly accessible site, there will also be the facility on the site itself for customers to offer feedback, both in free text format and through structured questionnaires. In addition to online consultation, offline consultation will also take place by way of focus groups, userlabs, and service location specific activity (such as eg consulting on library pages in an actual library). Further transparency of the process will be ensured by the process itself being blogged along the way – again, on the alpha site itself. It’s not my custom to publicly mourn the death of famous people; generally, it’s a thing other people do which makes me feel a bit icky – I didn’t know the famous person, and the famous person didn’t know me, so whilst it’s always sad when anybody dies it seems pointless to outpour grief for somebody one didn’t know and who didn’t know you. I’m not going to break that habit and publicly mourn the sad death of Gil Scott-Heron, but instead I’m going to talk about the best concert I’ve ever been to in my 41 years of life, and what perhaps will remain the best concert I’ll ever have been to in what remains of my (hopefully at least another 41 years!) of life. It’s a story I’ve told people in person more times than I care to count; there’s some people who’ve heard it more times than they’d care to count. I tend to present a fairly robotic, sentiment-free face to the world, but telling this story is one of only two (and you can read the other one on birmingham-alive!, if you want) which genuinely brings an emotional tear to my eye, rather than just my allergies to the many airborne particulates where I live. I can’t quite remember if it was late 1989 or early 1990 (it was definitely that academic year, because I was in my second year as an undergraduate at Birmingham Conservatoire) that I went to a concert at the Birmingham Hummingbird. Myself and my best friend at the time arrived at 8pm, the doors open time printed on the ticket, got a drink each, and waited. And waited, and waited, and waited. It’s fair to say after that we waited some more, followed by some more waiting. Eventually at about midnight(!) a band came on – it was the a-capella group Black Voices, doing what I think might have been their first ‘proper’ concert in a big venue. They sang for about 40 minutes, and it’s fair to say that considering the ticket price, we felt we’d got our money’s worth just for that. Then, at about 1:00am another band came on – Microgroove – who played for about an hour. Unquestioningly, it was easily worth the ticket price just for them – so much so, by about 2:00am when they finished we assumed the concert was over, since back the Gil Scott-Heron had a particular reputation for not turning up (or rather, being detained by airport security…). But the stage manager announced over the PA that we should rest assured, the concert we were going to see was going to happen. Then about 2:30am, the man himself came on to the stage, sat in front of his Fender-Rhodes electric piano, leading us in what was his at-the-time concert opener, Five Miles Down. And then the rest of the band came on, treating us to at least two and a half hours of the most amazing concert ever, including a 30 minute version of the song Angel Dust. At the close of the concert, myself and my friend walked back home to our flat in Kings Heath. I’ve not told you how much the ticket cost yet. Then there are the current fears that the move of the Wholesale Markets from right next to the Bullring Market will cause major hassle – Jon Bounds has commented on the silliness of the image of traders wheeling trolleys full of cabbages half way across town half way through the trading day, but there’s the very real concern of how produce will be then transported, coupled with the new uncertainty surrounding when the move will actually happen. But to me, what has finally killed the market is the combination of the serious drop in quality of the produce on sale, combined with the scourge of the man from the weights and the measures, the Poundabowl. Now don’t get me entirely wrong – where the typical shopper might think more in terms of a number of items rather than a weight of items, there’s nothing wrong with it; but it still makes price comparisons difficult, because you don’t know how much you’re getting for your pound from different traders – you may well even be getting a different amount from the same trader each time you buy! Until recently, produce from the market always tended to have what supermarket fruit and veg well and truly lacked – flavour. I still remember like it was yesterday my reintroduction to the market (after being horrified by reading Felicity Lawrence’s supermarket exposé, Not on the Label) and rediscovering that an onion is an actual real vegetable with a texture and a flavour, rather than some white thing which goes in the dinner for I’m-not-really-sure-what-it’s-adding. The market produce was the blemished, funny shaped stuff which the supermarket bland-o-matic rejected as being Not Possible To Bland. But of late I’ve noticed that the flavour is less noticeably different from the supermarket, but more critically, the quality has gone right down the pan. It’s no use buying four or five peppers for a pound rather than three or four peppers for £1.50 if you only get to actually use two of them because the rest have become a putrifying blob of mush after a couple of days. I already decided a couple of weeks ago to stop getting my onions from the market because basically half of them were rotten even on the day I bought them. Today, when I went to my usual stall for getting peppers, I was saddened to see they too have gone over to poundabowl. Rather than hand-picking the precise peppers I wanted (ie, the ones which looked the least off) I would have been forced to accept the ones in the bowl. I usually get a mix of colours, but these bowls were all monochrome – when I asked the assistant for a mix, her reply was “no, I’m not allowed to do that”. So I walked away and found another stall. The other stall was also poundabowl, but at least when I asked if he could do a mix he said yes. When I checked in the bag to see how mixed he’d done it (just one red to five greens – I wanted three reds and three greens), I saw that two of the peppers were a putrifying blob of mush already. If I can’t even rely on what I buy being of merchantable quality on the day I buy it, I’m not sure I can be bothered going all the way down there to buy in the first place. So for that reason, I’m out. And rightly so - whereas Ravi Shankar is, as they say, a master, Zakir Hussein is the master. But more to the point, whereas Ravi Shankar in his high profile collaborations with western musicians has largely done his own thing bolted on to the side, Zakir Hussein has very much been much more devlopmental in the field of Indian / western musical fusion, going back as far as the 1970s with the band Shakti with John McLaughlin, through working with straighter jazz artists such as Airto Moreira and Pharoah Sanders, and through to the more techno sounds of Tabla Beat Science. After a vocal beatbox introduction by percussionist Taufiq Qureshi the concert proper opened with a blast from the Dancing Drummers of Manipur; the programme described them as 'dazzling and athletic', which was no word of a lie as gymnastic backflips were in full evidence - simultaneously to the actual business of drumming! The Dancing Drummers then left the stage not to return again until the very end of the concert, which did seem somewhat of a shame, leaving me feeling they were participating as some kind of token gesture rather than being properly included. After their stint Hussein and sarangi (a kind of Indian style violin) player Dilshad Khan took the stage for a traditional raga performance; Khan opened with the introductory alaap solo, then becoming the accompanying instrument for the rest of that half after first Hussein joined in for the jhor section, with then Bhavani Shankar (no relation) adding - often perfectly synchronised with the tabla - to the drumming mix with his sideways drum, the pakhawaj. There's the old cliché in the rock music world of 'boring us to death with a drum solo', but in the Indian music world, nothing could be further from the truth, especially with drums in the hands of greats such as these. And in an amusing twist to the bol, or 'tabla speech' (where the drummer speaks the rhythms as well as playing them - used as a teaching method rather than performance itself in its proper setting) feature which we are used to getting in concerts here, it was likened to a proper conversation: 'come in, sit down, enjoy the concert; dha ti-ki-taah tun ti-re-ki-ta dha ghe dha ghe KHAT!'. Well it amused us in the hall, anyway. As the first half was quite firmly traditional classical Indian music, knowing the performers' pedigrees I assumed the second half would be much more fusion-based, especially since all the way through the first half there was set on the stage a western drum kit (minus kick drum) left unused. But instead when then musicians returned to the stage the sarangi was replaced by a sitar, which this time continued to take the lead as the solo instrument in a traditional raga performance. Finally percussionist Qureshi joined the ensemble on stage, when I realised actually we were being treated to something more interesting than the straight fusion I was expecting. As Qureshi was clearly playing western (and African, as at one point he was playing a djembe simultaneously with the rest of the kit) drums but according to Indian tala principles it occured to me that for the second half we were getting neither traditional Indian music nor 'fusion', but something best described as Indian contemporary classical music - showing that the forms of Indian classical music can, and indeed have, developed over the years just the same way as western classical music forms have changed. Building through we had a fitting grand finale as the performers from the first half returned to the stage to close what was a fine concert - a concert where I didn't get what I was expecting, but instead was treated to much, much more. Unlike many rock reformations, where it feels like the spark had long gone and has barely been rekindled to pay an unexpected tax bill, the return of Portishead shows a group of true dedicated and accomplished musicians demonstrating as much skill and energy today as they did on the album which converted me. The opening track included loud heavy guitars demonstrating them to be so much more than the label 'trip hop' leads one to assume, but the intimate numbers are still there with the band gathering around close in to each other sitting in a huddle. Importantly, each song blended perfectly with the one preceding and following, and the sudden endings - a feature which often irritates me in a band - in this case were just 'right', an important part of the music rather than laziness. The Lalo Schifrin-esque melodies which wouldn't be out of place in a James Bond soundtrack are still occasionally there along with the live turntablism (I do often wonder, does it matter what records they're playing when they're scratching? ), together with a more classic analogue synthesisor soundworld - I counted at least two Minimoogs on stage. Unless you can make a trip to Paris or Brussels early next month you've missed your chance in the UK on this tour, but if you fancy a Bank Holiday Eurostar trip you could do no worse. Hopefully we won't have to wait another 10 years to see such a truly great band. In essence, the story centres around a family feud between two sets of royal cousins - the Pandava brothers and their common wife Draupadi, led by our hero Arjuna and the Kauravas, headed up by the villain Duryodhana. I say villain - the philosophy of the epic tends to present a universe where all are governed by destiny, unresponsible for their actions, and Duryodhana was "born to hate the world and all that is in it". In the west most people might be more aware of the Bhagavad Gita, the discourse within it where Krishna teaches Arjuna the nature of dharma, or duty, on the eve of battle as Arjuna has doubts about what he is about to embark on, ending here with the famous quote "Now I am become death, the destroyer of worlds". As with any great epic, there's love, deceit, and a great battle in which hundreds of thousands are slaughtered, with it being highly debateable whether there were truly any winners at the climax, and ultimately Draupadi, who is a perhaps surprisingly modern woman for the time the story is set (5000 years ago) makes the decision to end the pointless cycle of revenge and counter-revenge. Not every member of this cast could quite handle all of those aspects themselves, but all were highly capable in at least three of them each, and as an ensemble cast achieved the goal admirably, seemlessly integrating as they moved about all three dimensions of the stageset so you would be hard pressed to work out who was better at what. Categorising the genre of this production is less than straightforward for those used to standard western performing arts; it is a piece of Kathak, which at its heart is a work of dance, but is so much more than that - a true Kathak performer must be able to dance, sing, act, mime, speak, play percussion instruments, and work puppets. Ensemble is certainly a key word to describe the production as a whole, in fact. Often in musical theatre or dance one is left with the impression that the creators of the choreography, music, and text will have occasionally spoke on the phone together, but essentially worked in isolation leaving it to the director to finally bring the components together, but in this production there was an overriding sense of genuine collaboration between all concerned, working together to produce a united whole as a production from the outset. On the credits page Nitin Sawhney was listed first as composer for his fine music, but perhaps an alphabetical credit listing would have been more appropriate. Amongst the musicians the ethereal bansuri (Indian flute) playing of Lisa Mallett must be given special mention as it floated throughout the theatre, and Natasha Jayetileke's Draupadi was every bit the strong-whilst-feminine woman of the story. In staging and set design, less is more was clearly the operative thinking - which is by no means to say it was minimal or sparse, but instead well judged, tastefully designed, and effective. The most complex visual effects were executed by means of pieces of cloth, lights, and mesh screens, proving that lasers and video screens are rarely necessary to create the magic of the stage. It may just have been because it was Tuesday night, but sadly the Alex seemed to be barely half-full - if you have no evening plans for any night the rest of this week, you could do little better than to catch it whilst you can.